Alex Dugdale photo by Daniel Sheehan. The Seattle Repertory Jazz Orchestra (SRJO) performs the Sacred Music of Duke Ellington each year during the holiday season, in the historic confines of Town Hall, or most recently, in St. Mark’s Episcopal Cathedral while the First Hill landmark undergoes renovations. Thirteen years ago, 16-year-old Alex Dugdale prepared to perform in the show for the first time, eagerly anticipating his tap dance feature during the piece “David Danced Before the Lord with All His Might.” His mind raced back in time to when he chanced upon the tap genius of Savion Glover while watching Sesame Street as a four-yearold, and decided it was something he had to do. His parents facilitated his dream with lessons beginning at age five. For the 2018 edition of the concert, SRJO continued to feature Dugdale as the main tap artist, in addition to his current duties holding down the baritone saxophone chair, previously held down for decades by the legendary Bill Ramsay. 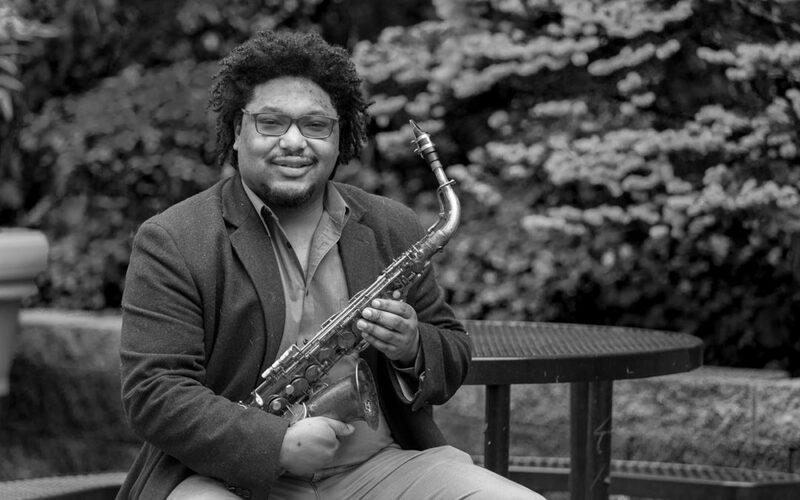 Dugdale joined SRJO in 2015, manning the second alto saxophone chair under the direction of Clarence Acox and Michael Brockman. His prowess on all the woodwind instruments began with his clarinet studies in elementary school, but it was tap that spoke to him first, opening up the jazz world to the talented, impressionable young artist. A trip to New York with his mom, and a street performance of the Ellington and Billy Strayhorn classic “Take the A Train,” would prove pivotal in the creative evolution of the then 11-year-old Dugdale. The tune had been presented to him by his tap instructors as a means to perform the Shim Sham, the renowned “national anthem” of tap. Performing in the subway, young Dugdale danced and found a wellspring of creative impulse, a means of expression that would impact his life as a musician,. “I found that to be emotive in the moment, it’s tap dancing for me,” he recalls. Dugdale’s current impact on the Seattle jazz scene is multifaceted and gaining momentum, without the benefit of an album release. Live performances with his Fade Quintet and SRJO have put his prodigious abilities on display, with his talents as a saxophonist and tap artist playing off each other to create an identity that is decidedly his own. There is simply no other artist combining those skills in the manner in which he performs. Dugdale’s frequent appearances at Tula’s Jazz Club in Belltown generally include a full house, and a hard driving sound reminiscent of the hard bop artistry of his saxophone heroes Hank Mobley, Lester Young, and Johnny Griffin. He incorporates his tap artistry as a solo instrument, introducing rhythmic aspects not normally associated with traditional jazz dance fare. While tap entered his creative lexicon first, his thought process as a dancer is guided by his approach as an improvising musician. “I think like a horn soloist when I tap dance,” says Dugdale. Tap opened his ears and mind to the limitless horizons that jazz improvisation provides a musician, while in turn, jazz music began to impact his jazz expressionism as a tap artist. “As I grew more musically on my instruments, I was able to make sense of my skills with my feet and turn that into music. I had a lot of chops in my feet, but I wasn’t saying anything,” he says. The unusual skill set employed by Dugdale allows for an innovative approach that works in multiple ways. As an instrument, most dancers view tap as a form of percussion, while Dugdale clearly sees it as a melodic instrument. Consider for a moment the classic tune “St. Thomas” on the iconic Sonny Rollins album, Saxophone Colossus. The listener can hear the melody during the drum solo by legendary drummer Max Roach. In this solo, you do not hear a steady bass drum. You do however, hear a walking bass throughout. Removing the steady bass drum allows the drummer to learn more about time and phrasing. The drummer has to internalize the time without specifically stating it. This structure creates the freedom for Roach to feel time so strongly that he can play syncopations without losing the time flow. Now that the bass drum is no longer restricted to playing a steady beat, it can be used as an integral part of the rhythmic line. The drum set in total is given the freedom to express melody, and simply play music. In Dugdale’s case, within one tune during a given performance, he is capable of employing both the mindset of a melody-based drummer, and a saxophonist in one breath. The result is completely original. Being original, of course, is not a solitary endeavor. As a musician, Dugdale had the benefit of clarinet tutelage from Mark Edwards, as well as saxophone studies with ace altoist Mark Taylor. Those early studies bore fruit upon entry into Scott Brown’s program at Roosevelt High School. As fate would have it, Dugdale now plays with both Taylor (tenor saxophone), and Brown (trombone) in SRJO. Age is never an issue in the jazz world, Dugdale’s story perfectly encapsulating that reality. Dugdale is currently exploring the best avenue to record his beautifully articulated original compositions, no doubt employing his long-standing band that includes veteran pianist John Hansen. 200 Trio members Cole Schuster, Greg Feingold, and Max Holmberg round out this ensemble that has achieved an uncommon musical telepathy in a short period of time. In the meantime, Dugdale is exploring his passion for working with grade school students in the Seattle School District. He sees providing mentorship to young students as an essential part of his musical being. “I love my music, and I love teaching. I love it so much, I wouldn’t be me if I didn’t do both,” he states decisively. Performing is the fuel that fires what he employs in the classroom. “Be a professional in your field, and then bring that into your classroom,” he affirms. Dugdale was given the opportunity to perform with SRJO as part of the 2018 Earshot Jazz Festival, with special guest Maria Schneider. On the eve of performing with the Grammy winning composer/conductor, Dugdale was wrapping up rehearsal with the band at Benaroya Hall. He wanted to express his gratitude to Schneider for having the privilege of performing under her. What came out was his desire to dance to the Schneider composition, “Gumba Blue.” He could hear the rhythm, the cadence while playing the tune on baritone, and felt the music in his feet. “If only I had known you were a tap dancer,” Schneider exclaimed. Shortly after grabbing his shoes and board from his car, Schneider agreed the fit was positive, and the next day SRJO audiences were treated to not only the eloquence of his musicianship, but the tap artistry that has fed that ever evolving musical skill set. “It was one of the few times I danced with my eyes closed, so I could hear the arrangement in my head from the perspective as a baritone player. It would be like giving the drummer a baritone chart,” he recalls. “She has an inspiring and intimidating aura, and approaches [music] like a classical conductor.” Dugdale’s enthusiasm and fearless approach to the art of jazz will be felt in our city for decades to come. He stands at the forefront of a wave of brilliant young jazz musicians currently on the scene. The music continues to move ever forward and with Dugdale it’s in good hands—and feet!